Every Sunday I read the New York Times. While I don’t necessarily read cover to cover, I always read the ‘Weddings & Celebrations’ section because I like to see who of my colleagues is officiating at weddings. And in the last few years, every Sunday, I get aggravated. There are increasing numbers of couples that do not get married by trained professionals, religious officiants who have taken courses in pastoral and pre-marital counseling. (For the record, I do not know what judges and other judicial officers require to officiate at a wedding. They might refer to a trained counselor to do this or do some of it themselves. If an officer of the court requires this counseling they are in this category). Instead, a friend or relative became ‘ordained’ (and that is in quotations because they did not do any schooling to get their ordination. It is more of an online form to fill out and a fee) and officiate at their wedding. Every clergy person that I know, regardless of denomination or faith tradition will only officiate at a wedding after meeting with the couple and doing several session of pre-marital counseling. These sessions ideally take place in-person but if necessary, can even take place over Skype/FaceTime/Google Hangout. Some clergy do this in a combination of group meetings (with a few other couples) and private sessions or just 3-6 private sessions. Here is a post about what a couple might expect from these meetings. 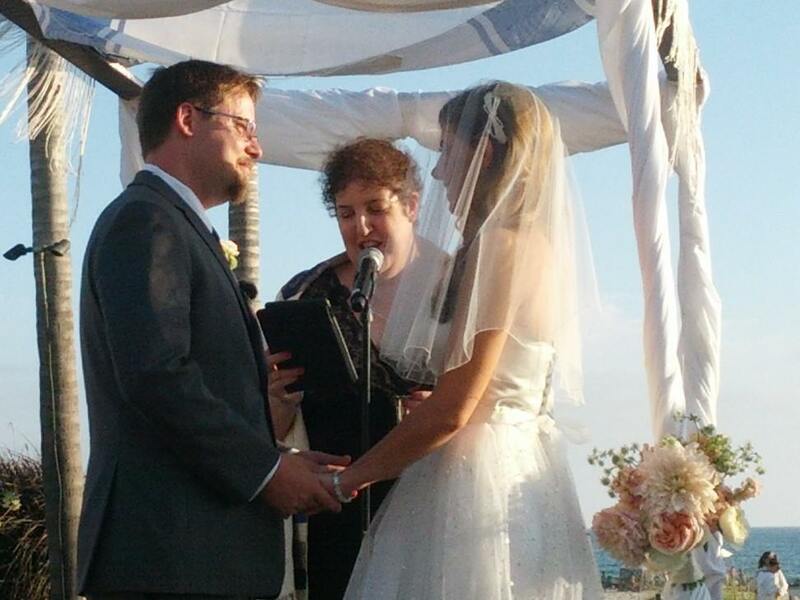 Me officiating at a wedding for a beautiful couple in a gorgeous setting. I do understand that not every couple has a shared faith tradition or wishes to have a religious officiant for their wedding. (This might make it even more important to talk about religion and marriage.) I assure you this isn’t a plea for religious weddings. Couples should have an officiant who meets all of their needs. However, it is a call to acknowledge that while a couple’s wedding day should be extremely special, it is also really about a marriage, one of the more significant commitments that two people enter into together. Officiants who are trained to about a marriage and what all involved hope to be a long-time relationship can help to solemnize a wedding that will lead to that of marriage. The divorce rate in this country is extremely high. While marriages end for a wide variety of reasons, perhaps having an appropriate officiant and some pre-marital counseling could help lower this number. It can only make for a more healthy relationship! This entry was posted in clergy, work and tagged friends, work. Bookmark the permalink.